After such strong blogging in July, I kind of took an unintended blog break this past week. I had a few posts in draft that never ended up being published. I guess I did a little more life and a lot less commputing! But today is the perfect day to get back at it!! Today in my neck of the woods it's pouring down rain!! I wanted to get this one out way sooner because I'm so excited about it. 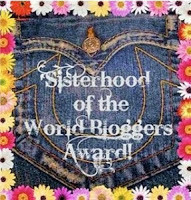 I have been nominated by Shelly at The Queen in Between for the Sisterhood of the World Bloggers Award. Thanks Shelly! The rules are simple. The goal is to learn a little bit more about the blogger by asking them 10 questions then nominate 10 or 12 more bloggers to do the same with a set of your own questions! Tell your nominees they've been nominated by leaving them a comment on their blog. And don't forget to thank the blogger who nominated you, too! 1. How did you decide on your blog name? Well my blog started out as a joke. I was pretty old when I moved out on my own (maybe a low paying catholic school teaching job and a bad shopping habit are to blame! HA! Actually I just don't like change!) But when I finally did, all these crazy things started happening. I would go into work and tell my stories and everyone would laugh. I joked that I could have my own blog called the Mishaps and Mayhem of a Solitary Life. My friends agreed and said they'd totally read it. So I just started it. It was really just for me in the beginning but has grown into something I'm really proud of. A hodge podge of everything these days...friends, family, food, fashion and FUN!! Read my first ever post from back in the day here! The older posts are fun!! 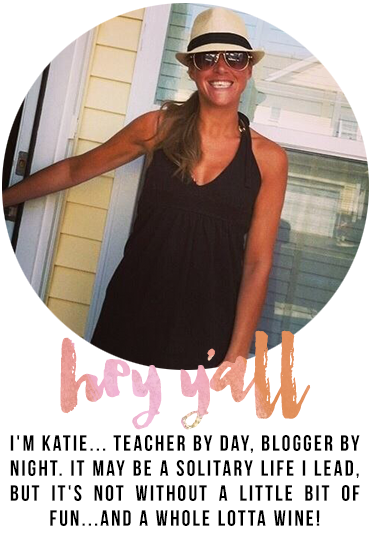 The blog really picked up steam in 2104 but I really love those initial posts! 2. What tip would you offer new bloggers? 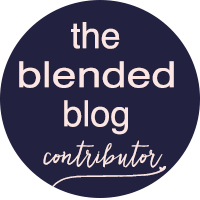 Well, I still think of myself as a fairly new blogger! But I would say write about what you love and find your niche! Make it you! And join link ups to find new blog friends and blogs you might enjoy reading as well as to help expand your audience. I'm always finding new blogs! Actually I am doing it. I always wanted to be a teacher. I don't ever remember wanting to do anything else. I'm going into year 14 of teaching. I've taught 3rd, 4th, and 2nd grades. For the last few years I've been my school's librarian and technology teacher. Now I teach all 300 students in my school. 4. What would you love to get paid to do now? Hands down: SUMMER!! I am just a happier person when it's 85, sunny and I have a tan! 6. 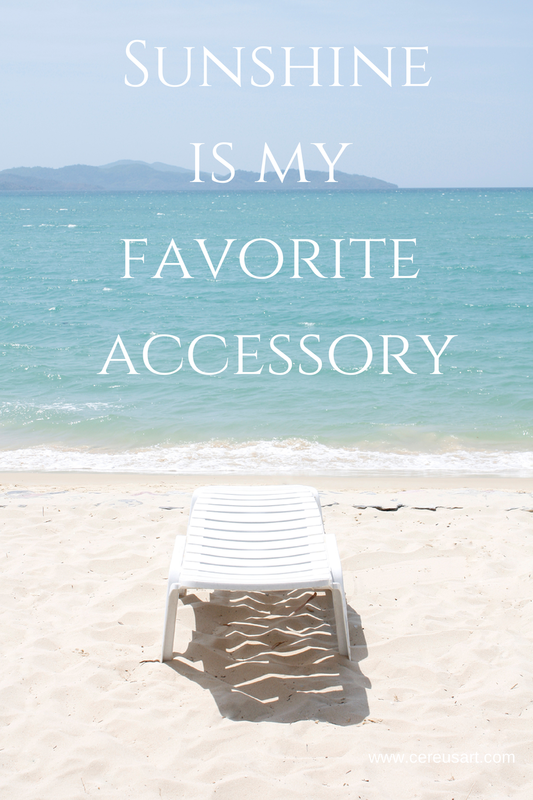 What is your favorite summer outfit? I like easy in summer! 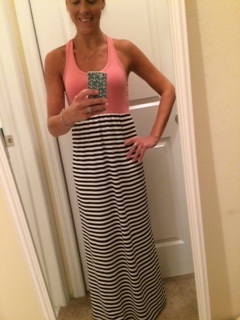 I like to throw on a dress and go! 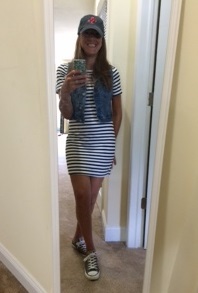 I seem to be wearing these two striped dresses over and over this summer!! 7. What is your favorite summer cocktail or mocktail? I like it all! But it depends on the day and who I'm with! 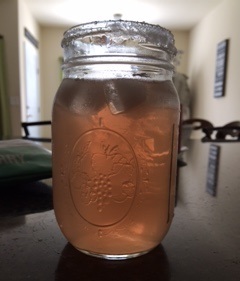 This summer I am really into lemonade cocktails! So refreshing! But nothing beats an ice cold beer on a hot summer day, or a nice glass of wine to end a summer night! When I was little, every year my family traveled to Emerald Isle, NC and rented a beach house for a week with my cousins. I have so many great memories from those trips. Each year our group seemed to grow to include more family and friends. 2 different summers we were evacuated due to hurricanes! My family still goes to NC. 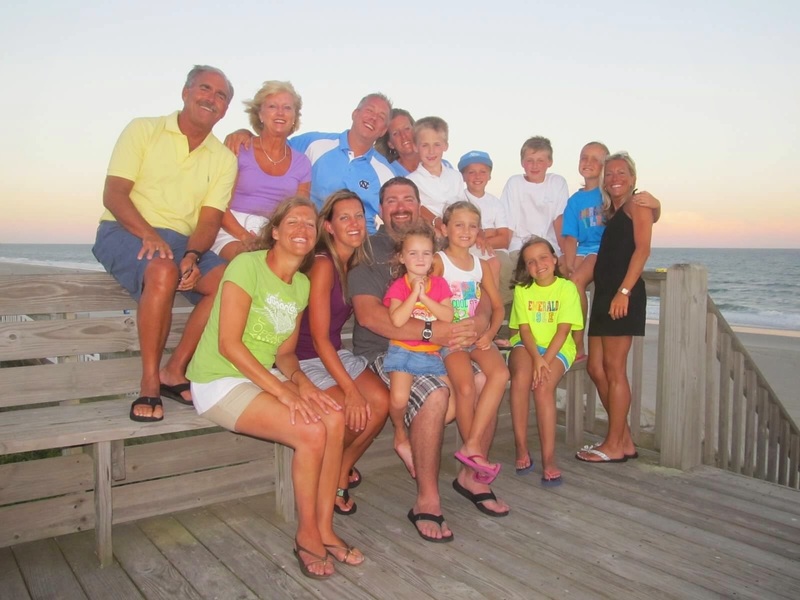 Not every year, but often and now, with kids...a little closer in the Outer Banks. . And since the family is so big now, our family fits into a house all our own! Things have changed a lot over the years, but a week with family at the beach is still always fun! Great question!! I've love it if Reese Witherspoon played me!! 10. What is your favorite tip for balancing all the "in betweens" in your life? So fun!! Thanks again Shelly!! Now it's my turn to nominate and ask the questions. Hope these ladies are up to the challenge! I'm nominating some of my fellow Style Me Bloggers (who I don't think have been nominated yet) and some of my bloggy friends! 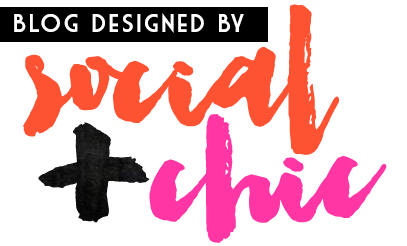 Love reading their blogs...hope you do too!! What's your favorite guilty pleasure show? What season do you think is easiest to dress for? Have you ever done anything that's taken you out of your comfort zone? If so, what? What genre of music is your favorite and why? Woo hoo! Loved reading your answers to the questions Shelly posed to you and I am super excited that you tagged me to share in the fun. I can see Reese being Katie in your life story. You picked a strong, fun-loving lady! I understand and applaud your passion for teaching. It really isn't about the money, is it? But an occasional cost of living raise never hurts. Your striped dresses and lemonade drinks look very refreshing. Thank you for sharing more about you with me. I loved this post! I'm so glad you enjoyed NC during your childhood, it is a pretty awesome place but I am a bit biased ....and Reese, for sure!!! Well, thanks for the nomination...I'll have it out soon. Thanks so much! So glad you found me! Thanks for visiting and for your kind words!! Oh I love this! Thanks for the nomination, I'll work on it! Found your blog from the comments on my guest post for Christina yesterday and I'm so glad that I did!! Loved reading this and getting to know about you! :) New follower!! I think teachers should be paid way more than they are - you guys do such an important job! Thanks so much for the tag - it will be fun to answer these questions! Thanks so much for taking the time to post comments! They make me smile so big! 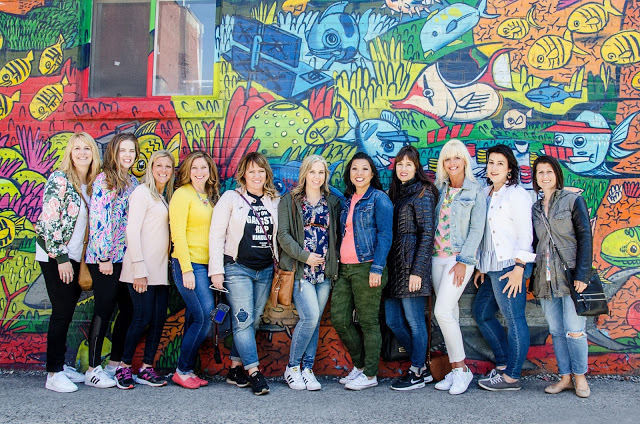 TBB Takes Toronto: a recap! Random Thoughts for a Thursday! Sing Along with this Saturday Six! Monthly Rewind: July in Numbers! My Picks: All things Entertainment!